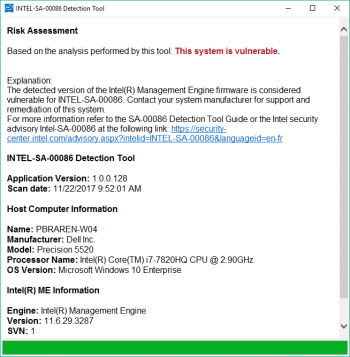 You may have read about the Intel Management Engine Flaw, earlier this year, along with yesterday and today's wave of new articles about an Intel portable tool to check if your Windows or Linux system is vulnerable, with a step-by-step look below. You can read up on the Intel Management Engine in the See also section below. 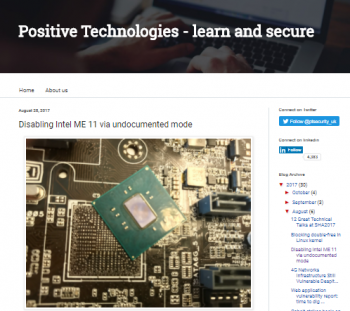 Worth noting that Intel doesn't claim upcoming BIOS fixes will disable ME (aka IME), just that the potential for remote execution will be removed. The test of time will ultimately determine how good such BIOS fixes wind up being. Note that even the Intel® Xeon® Processor Scalable Family (Purley) CPUs are possibly affected here, so this has potentially pretty serious consequences, see what Google plans to do to remove ME functionality entirely, without having to rely on Intel. we had no easy way to check for ourselves whether we are vulnerable. 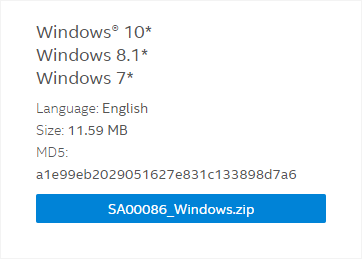 At least now we do, Windows direct-download link. 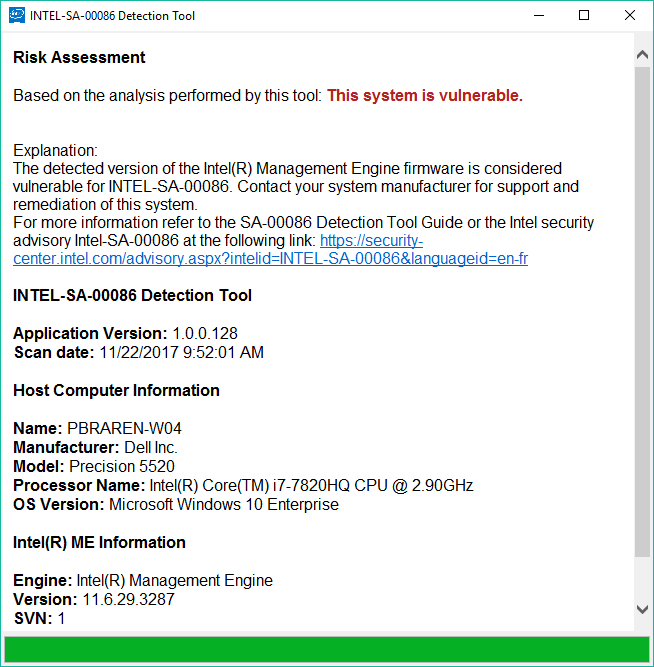 Based on the analysis performed by this tool: Detection Error: This system may be vulnerable. Progress bar makes it to 100%, but no results are displayed. 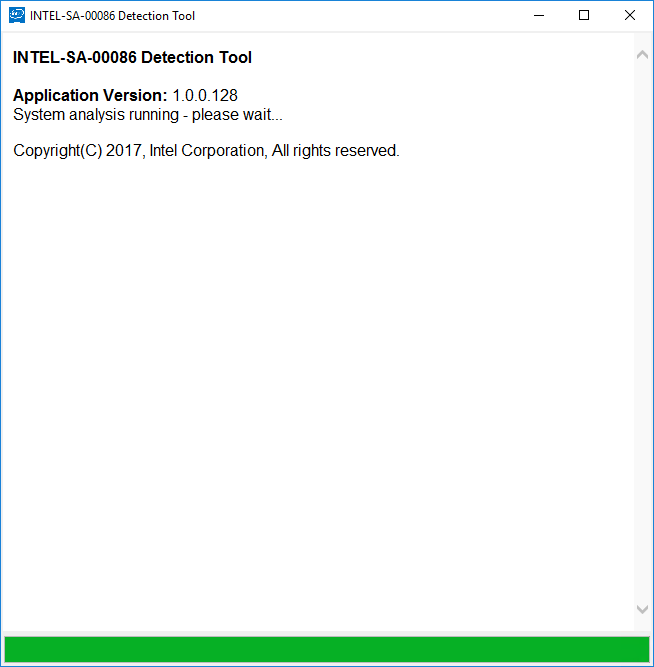 The INTEL-SA-00086 Detection Tool doesn't seem to know how to run in a VM at all, simply hanging. This is what happens when I run it in a VMware ESXi 6.5U1 server, no results at all. Not completely a surprise, since it apparently requires low-level access to the underlying hardware and CPU to execute properly. But one would hope that it would error-out, or echo some kind of warning or suggestion. followed by the particulars of your system. 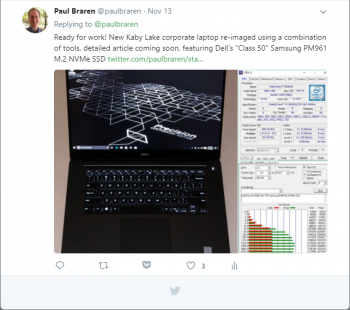 What about the Dell Precision 5520? Dell is aware of the Intel® ME/TXE Elevation of Privileges vulnerabilities. Dell is diligently working to update the affected platforms. 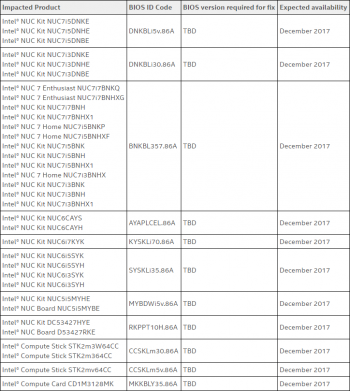 Firmware update details for these platforms will be added to this document as they become available and we recommend customers update their systems to the latest Intel Management Engine Firmware and iCLS Software by downloading the patched releases as they become available. That's less than 3 weeks away. 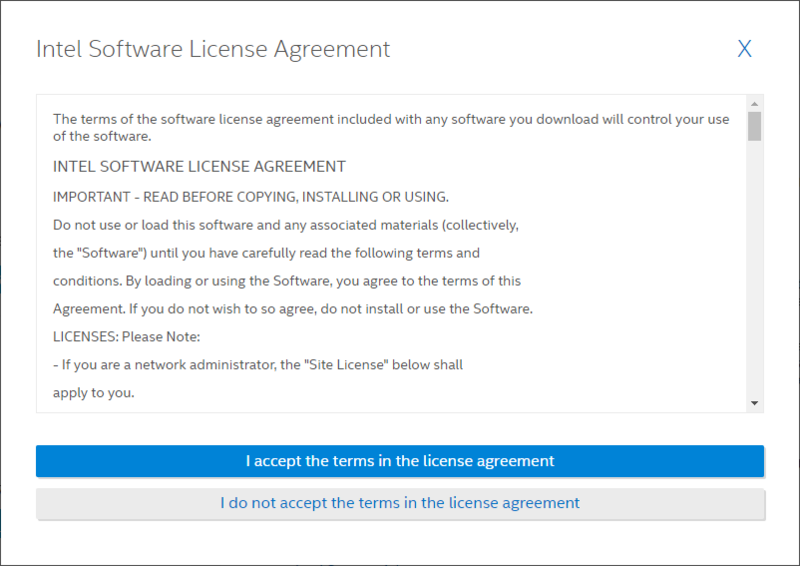 Seems Dell is taking this pretty seriously too. What about the popular Intel NUC? 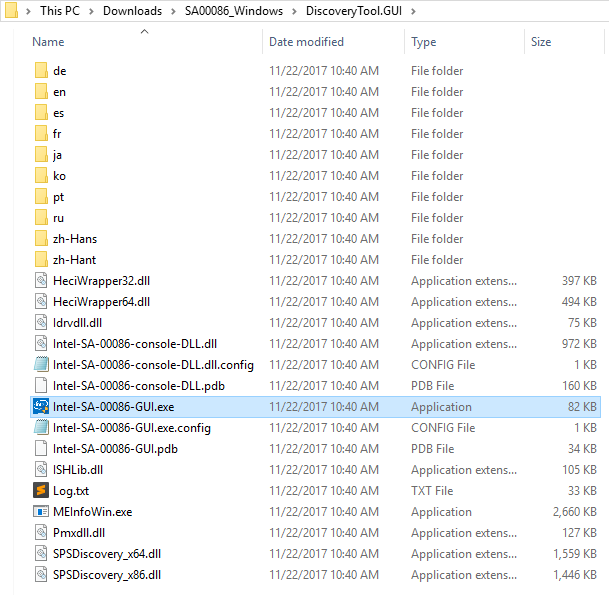 When will we see a fix for Supermicro Xeon D? 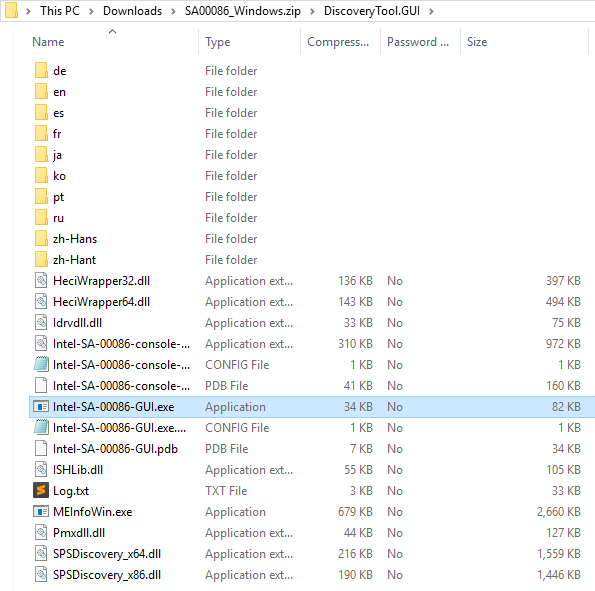 Do we need a BIOS fix for Supermicro Xeon D? It seems unlikely, for these two reasons. 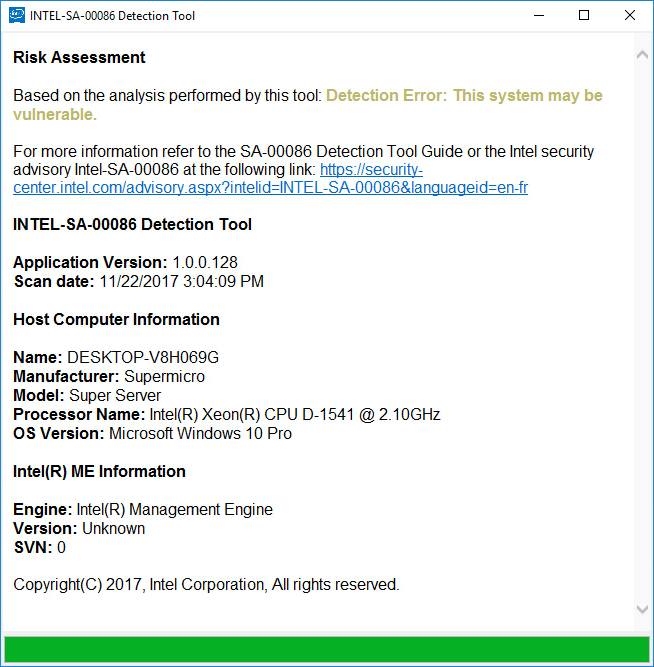 The test above says "Detection Error", so it's not saying that it found anything, it seems to be just saying that it is unable to run the test, so it isn't sure. 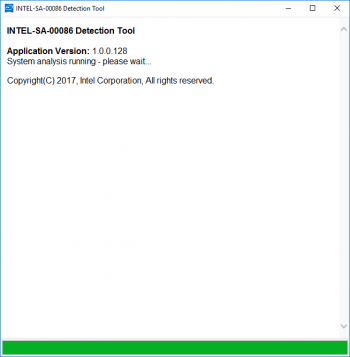 It appears that the current version of the INTEL-SA-00086 Detection Tool simply doesn't run properly on the Xeon D platform, so any pending fixes would instead be likely to come from Intel, in the form of a new version of the INTEL-SA-00086 Detection Tool. 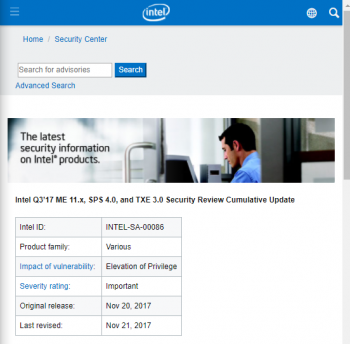 Let's hope, I've included @intel and [@IntelSecurity]() on my related tweet, but let's keep in mind that it is very nearly Thanksgiving holiday. 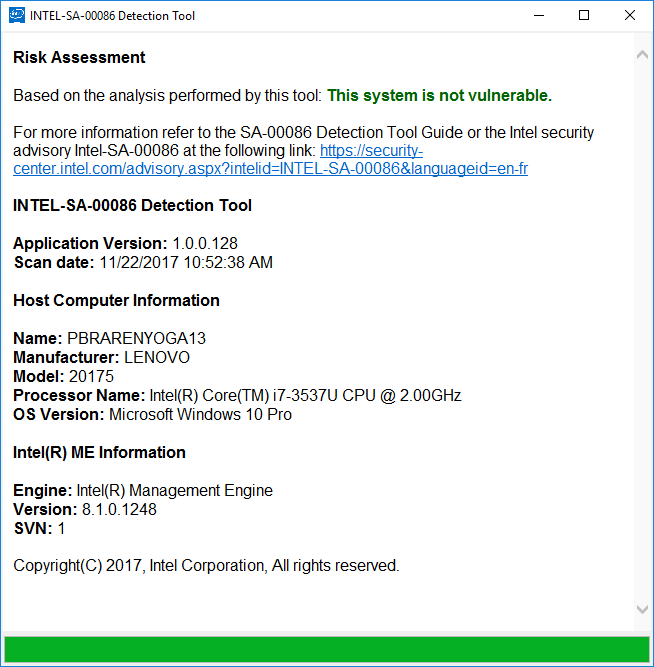 Note that you don't see the Xeon D, aka Intel® Xeon® Processor D Family, among those listed as potentially vulnerable. 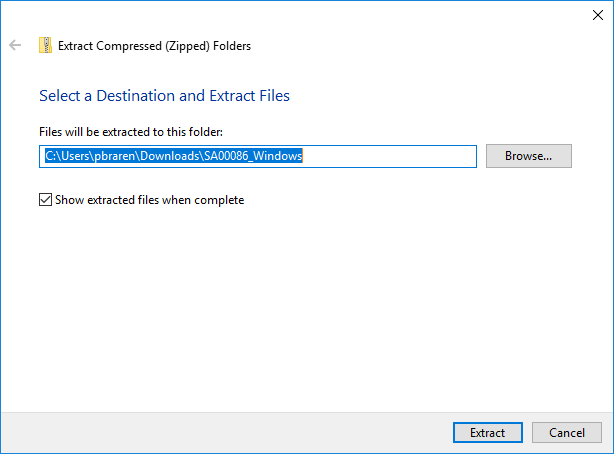 Use Intel's direct-download link for the Windows version of this portable utility, no installation is required. Then follow the steps below. 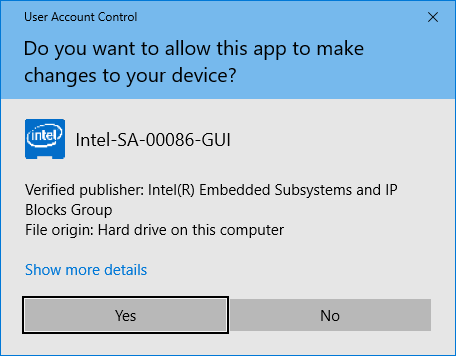 Given this issue could go back to nearly a decade of systems, and will likely require a BIOS update, the title has been adjusted, removing the word recent. Click the image to jump to the audio. Intel's disclosure reveals that 9 years of their chips are affected. vulnerabilities that could potentially place impacted platforms at risk." Here's the exact spot where Steve talks about the JTAG over USB discovery, and detailed shownotes. 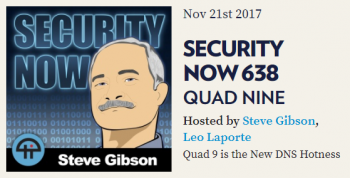 Nice podcast coverage of this Intel Management Engine kerfuffle by PC Perspective's Allyn Malventano. 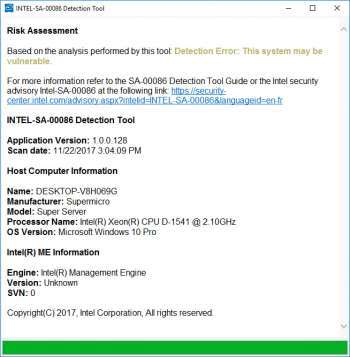 INTEL-SA-00086 Detection Tool does not apply to Xeon-D processors and therefore the detection tool was probably not verified on Xeon-D systems. 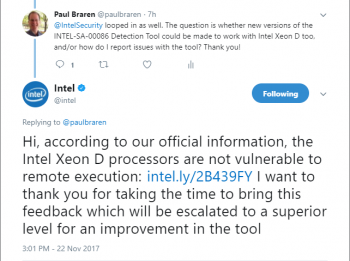 I was also told that running the INTEL-SA-00086 Detection Tool is not required on Xeon-D platforms. 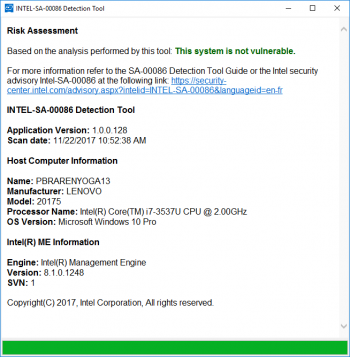 Some big tech companies that use Intel (INTC, -0.53%) chips, like Google (GOOGL, +0.07%), have talked about how they plan to disable the management engine as a way of eliminating its security vulnerabilities. The disappointing fact is that on modern computers, it is impossible to completely disable ME. This is primarily due to the fact that this technology is responsible for initialization, power management, and launch of the main processor. Another complication lies in the fact that some data is hard-coded inside the PCH chip functioning as the southbridge on modern motherboards.